The 1980’s were a decade full of one hit wonders that stick with us to this very day. No one-hit wonder from that decade may be as recognizable as A-ha’s "Take On Me". The song was released in 1984 and is known for it’s instantly recognizable hook, and its combination of synthpop and varied instrumentation. 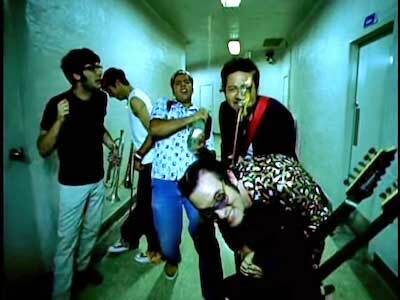 It’s a quintessentially 80’s song, so it was a bit surprising when ska punk band Reel Big Fish released a cover of it in 1998. Their version was released for the soundtrack of the 1998 film BASEketball, and the international version on their album Why Do They Rock So Hard?. 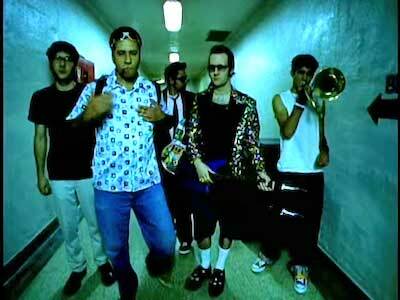 Reel Big Fish play “Take On Me” in the concourse of a stadium. The song remains lyrically unchanged from the 1984 version. It’s about a guy asking a girl to take a chance on him now because he can’t ask forever. Eventually he’ll stop, and then he’ll be gone, leaving nothing but regret for the both of them. The biggest difference between this version and the original is the instrumentation used. A-ha’s version was composed using the synthpop sound of the 1980’s, while Reel Big Fish utilizes classic ska instrumentation. This setup includes guitar, bass, drums, and a horns section. The horns section is a real standout, giving the track that bouncy feel that any good ska song needs. Your preference will depend on your taste in music as both are vastly different from each other, but Reel Big Fish’s cover add just enough to make it original while still honoring a classic. Grant Barry wears a colorful pair of chucks while playing his trombone. The original music video was released in conjunction with the film BASEketball, and was directed by Jeff Moore. It featured the band playing the song while walking through the concourse of an arena or stadium, and playing a game of BASEketball (the combination sport of basketball and baseball from the film) spliced with clips from the film. An alternate version of the video survives on Youtube today, and contains only the stadium aisle footage. 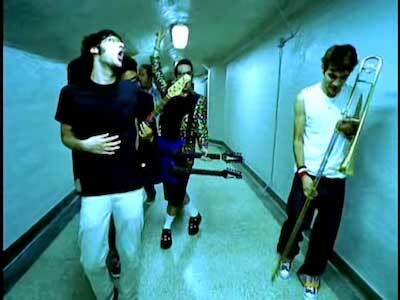 In both versions of the video, trombonist Grant Barry can be seen wearing a colorful pair of chucks as the group strolls through the building, which isn’t surprising chucks have and always will be a staple of punk and ska music. Compared to the original video for “Take On Me”, the Reel Big Fish version is a very low key affair, but it fits with their ska based sound. The song and video are updated versions of an 80’s classic that offer an original take and have become adored on their own right by fans around the globe. A vastly different take on an all time classic. Click on the links below to get a new pair of chucks to play BASEketball in.